Michael Douglas Praises Catherine Zeta-Jones' Success: "She Earned It"
Michael Douglas Says Catherine Zeta-Jones "Earned It"
Michael Douglas may just be Catherine Zeta-Jones' biggest fan. As the Hollywood star celebrated the upcoming release of Ant-Man and the Wasp this week in Hollywood, he couldn't help but have his wife on his mind. While fans may think of her big screen projects like Chicago, The Mask of Zorro, Traffic and other hits, Catherine has her hands in a lot of projects. "She's branching out in a couple other areas. She's got a whole branding line of Casa Zeta-Jones and she's on QVC and she's an entrepreneur and I totally support her," he told E! News' Will Marfuggi ahead of the film's release next month. "The acting roles, particularly for ladies at a certain age, become much more difficult. This is something where you can actually control your life so she really enjoys it." Earlier this month, the Academy Award winner made headlines for her wide-ranging interview with The Mirror. Catherine looked back on her career and explained how she came into her own. "One thing I'm not is humble anymore. I'm sick of being humble. I really am. 'So sorry I'm rich. So sorry I'm married to a movie star. So sorry I'm not so bad looking.' No sorrys. Enough," she told the outlet. "All that is important to me now is my work." While Michael was unfamiliar with the interview, he was proud to say his wife has earned her success. "She comes from humble roots. She's a humble young lady," he shared. "If you got it, flaunt it. She's probably saying I've worked hard enough. She earned it." 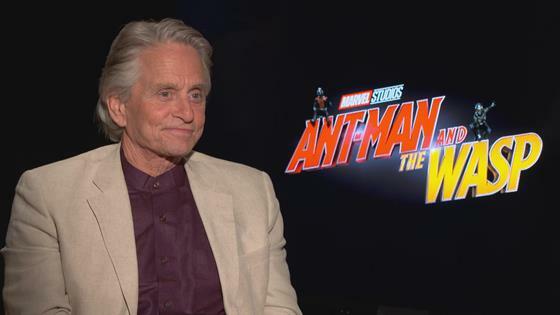 Michael Douglas Praises Marvel for "Level Playing Field"
For Michael, he certainly earned a spot in Marvel's latest sequel. Hitting theatres everywhere on July 6, the film finds Ant-Man (Paul Rudd) being both a super hero and a father as he receives a new mission to fight alongside The Wasp (Evangeline Lilly). "These aren't little sequels. These are big sequels," Michael told us in a separate interview before revealing how much his kids love being on set. "On the first one, they were there a lot and that's part of the joy of coming back again and they know Paul, they know Evangeline. The set is like Disneyland. If you get bored watching other actors, you can watch the stunt action on another set or the green screen…all of this to see." As for the possibility of seeing Catherine in a Marvel movie, Michael admits that's not his decision. He is, however, impressed with the amount of roles given to women in their various films. "They certainly are advancing the number of ladies. In this one alone, Evangeline has become a super action hero. And then we're introducing the world to Hannah John-Kamen as the ghost who is quite an amazing actress and of course Michelle Pfeiffer so they are broadening pretty quickly."